So if you’re road tripping in Maine for the first time, these are just a few of the things you might like to know, varying from cultural oddities to genuinely useful information. 1. The area code is 207. For the whole state. This makes phone numbers easy to remember, but it might be confusing if you’re from away. 2. People are just nice. The Northeast U.S. gets a bad rap for being unfriendly, but I think it’s the fast-paced city slickers that give it a bad name (don’t get me wrong, I love Philly, New York, and Boston–I just don’t expect eye contact or smiles when I visit). But Maine…it’s basically one big small town. People know each other and talk to their neighbors and catch up on town gossip at the hardware store. Even in Maine’s biggest city of Portland, people look you in the eye and say “hi” when you pass each other. 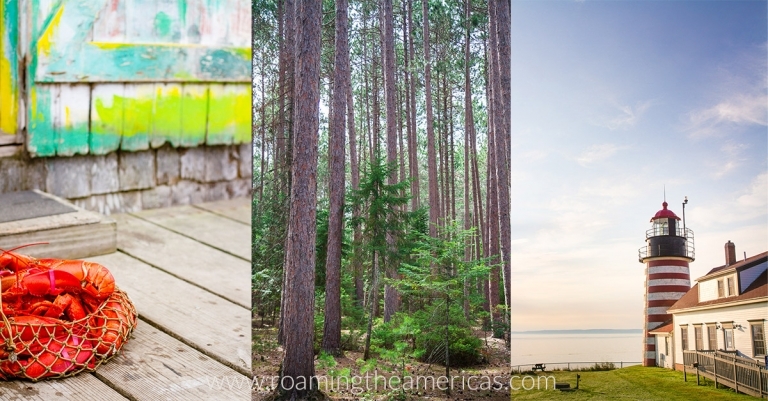 While visiting Maine isn’t exactly like traveling in the South–with all its irresistible charm and warmth oozing out of every conversation–Mainers have a no-nonsense, straightforward friendliness that is refreshing in our disconnected American culture. Seriously, even the toll booth workers are nice. 3. There are two Maines. You should see both. There’s the coast and southern Maine…and there’s the rest of Maine. It’s all quite wonderful, but if you want to get a full picture of true Maine life, you can’t skip inland Maine. 4. You need an atlas. If you do venture north of Portland, you’ll need a DeLorme Atlas and Gazetteer. Trust me, you do not want to rely on your phone’s GPS. This atlas is truly essential for a road trip in western or northern Maine*. Even if you manage to get cell reception or you download an offline map, it’s likely that Google Maps will take you down the most absurd dirt roads. The atlas, on the other hand, gives indication of road conditions and is very accurate. *Sometimes I think I’m remembering this only through the lens of how my family did things, but then I read things like this and am reassured that the DeLorme Atlas cult following still exists. 5. There’s basically just one interstate. I-95 branches off in some places (195, 295, 395, 495), but in essence there’s just one interstate. As for getting around the rest of Maine? It varies from US and state routes to back country roads, logging roads, and dirt roads. In short: it’s an adventure. 6. People really do have wicked strong accents. For example, Augusta becomes Auguster but dollar becomes dollah. Confusing, I know. Make sure to throw in a “wicked” every now and then. It’s sort of a “Maine inside joke” about how hard it can be to get from one place to another. If you ask for directions and someone says this, they’re basically telling you that it’s going to take a really long time on back roads to get there. See points four and five. 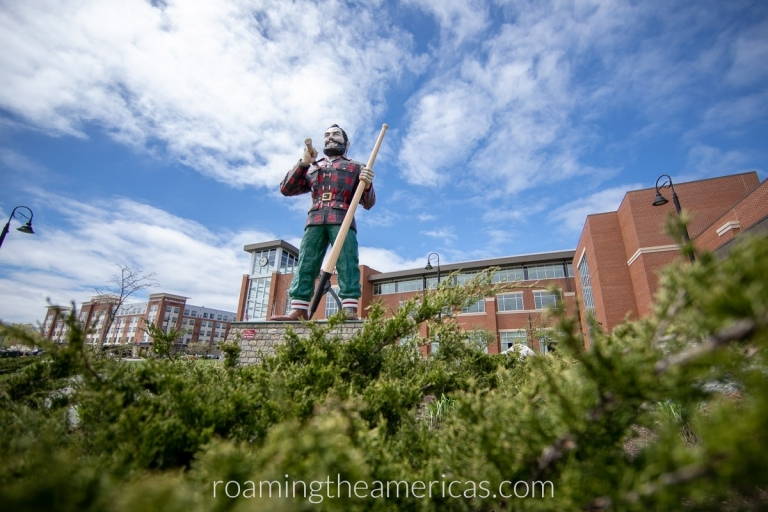 The Paul Bunyan statue in Bangor is a fun stop on a Maine road trip! 8. Maine is 90% trees. Combine this with no billboards anywhere in the state, and you will be looking at a lot of nature as you road trip around Maine. I kind of like the wide open interstate found north of Kennebunk, but you should probably be prepared with some road trip games to keep yourself entertained. 9. There are plantations in Maine. When you’re bored on a rainy day, I recommend perusing the populations page of the DeLorme Atlas just for kicks–it’s how my husband and I stumbled upon the intriguing story of Hibberts Gore, population 1. 10. The most common minority language is French. A bit unusual since in most of the United States, it’s Spanish…I find it fascinating to see signs in French near the border with Quebec! In some border towns, the percentage of people who speak French in their home is upwards of 70%. Here are some helpful resources with nitty gritty details to help you plan a Maine road trip! What other quirky, moderately useful facts about Maine would you add to the list?